The UCSC Theater Arts Department produces 2-3 shows a quarter, directed by both faculty and students. Each show will cast mostly from student actors, though occasionally they will also cast professional or faculty actors, giving students the chance to work along side professionals from the field. General auditions for all shows are usually held at the beginning of each quarter, during the evenings of the first Thursday and Friday of the quarter. Sign-ups for audition slots are posted in the A-building hallway (behind the Mainstage Theater) at the beginning of the first week of the quarter, and auditions are generally held in the same place. You can check the Audition Information Page for current shows and information, or contact the Theater Arts department office for upcoming audition times and information. Callbacks are posted after General Auditions late Friday night, and will also be posted online (NOT on the main Theater Arts website. There will be a URL posted at auditions.). Callbacks are held for individual shows on the Saturday and Sunday after auditions. You should not have any conflicts in call backs. Cast lists will be posted in the A-building hallway on Monday morning. To accept a role you must initial next to your name on the cast list, and arrive promptly for the first scheduled rehearsal. Very rarely department shows will hold separate auditions at a different time and place from the general auditions. If this is the case, information on those auditions will be posted around the department, and provided to the department office. In addition to the full productions Barnstorm produces, that are auditioned for during General Auditions, Barnstorm usually also produces several one-night shows during the quarter. These can consist of staged readings, cabaret shows, homages to TV and film, and more. Auditions for the one night events are held separately from general auditions. You can contact Barnstorm for audition information. If you have an idea for a production or one night Barn event you would like to produce or perform, you can submit proposals to Barnstorm towards the end of the preceding quarter of production. Please contact Barnstorm for more information on proposal submissions. Every Spring Quarter the department sponsors the Chautauqua student play festival. 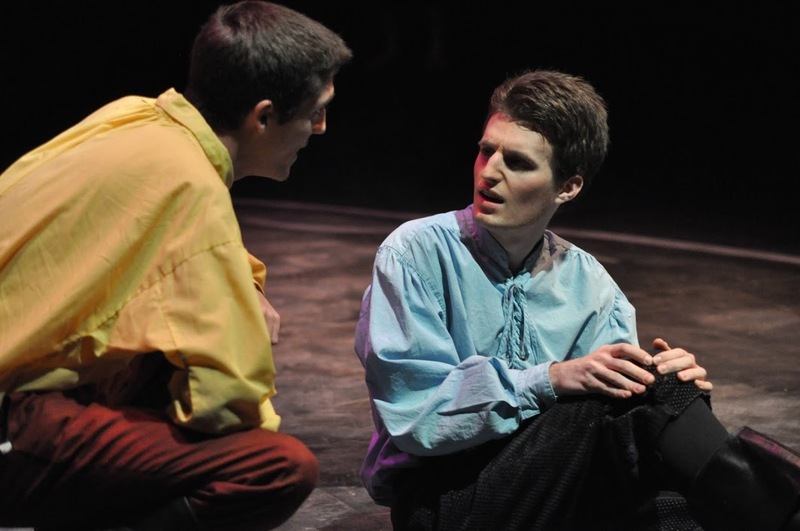 This is a festival comprised of student-written plays, directed by students. Auditions for Chautauqua are held at the beginning of Spring Quarter, usually separate from auditions for any main department shows. Callbacks for Chautauqua are held on the Saturday and Sunday following auditions. Chautauqua is often how beginning and freshman actors get their start in the department, having more chance to be cast in leading or featured roles in the festival setting. It is also a great place for beginning actors to receive additional support from specific acting discussion sections, and to gain experience in new aspects of theater, as every student in Chautauqua must fulfill multiple roles to facilitate the festival. Shakespeare to Go is a 50-minute version of one of Shakespeare's plays. Shakespeare to Go is directed by a faculty member, and cast from UCSC students. Auditions for Shakespeare to Go are typically held during the Fall Quarter. Please contact the Theater Arts Department for audition dates. Shakespeare to Go rehearses as a class (THEA 155, Workshop Experiments in Performance) during the winter quarter, which counts toward an upper-division studio or faculty production for Theater Arts major or minor requirements. Shakespeare to Go spends spring quarter touring local middle and high schools, usually on Monday, Wednesday, and Friday mornings. Actors cast in Shakespeare to Go must keep those mornings free from class or work conflicts. During spring quarter Shakespeare to Go does not count toward course credit. There are a number of additional performance opportunities on the UCSC campus, including Rainbow Theater and various improv and sketch comedy troupes. These opportunities and productions are not affiliated or sponsored by the UCSC Theater Arts department, and will not count as course credit towards the major or minor. As with all production opportunities, acting students are welcome to audition and perform in these shows as they see fit.